And they said to Him, Do you hear what these children are saying? Out of the mouth of babes and nursing infants You have perfected praise? All good gifts come from above. Heavenly Joy is no doubt a gift from heaven to her father and mother, Rodney and Joy Enriquez Jerkins. 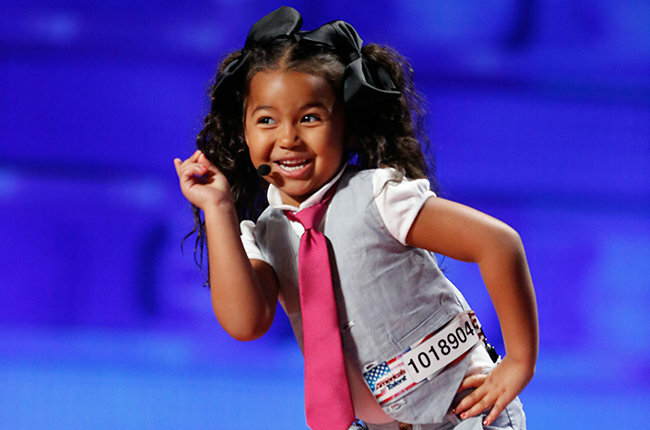 And now, thanks to America’s Got Talent her gifts and talents are bringing joy and laughter to many around the world! Heavenly Joy is an adorable talented child. Her vivacious personality is contagious. Jesus said that “out of the mouth of babes” would come praise to God! I would imagine her mother Joy Enriquez Jerkins has taught her about God’s love and all that Jesus has done for her. After Heavenly Joy’s stellar performance Howard Stern was inspired and reminded of the child star Shirley Temple. He commented; “You know, I think Shirley Temple is living somewhere inside of you. Is that possible?” She wisely replied; “Not Shirley Temple, Jesus.” Heavenly knew she is not embodied by the departed spirit of Shirley Temple, her temple is filled by the Spirit of Jesus! Heavenly Joy’s Dad is Rodney Jerkins who is an American record producer, songwriter and musician. Rodney has collaborated with many popular artists, including Michael Jackson, Jennifer Lopez, Whitney Houston, Janet Jackson, Beyoncé, Mary J. Blige, Mariah Carey, Rihanna, Justin Bieber, Luther Vandross, Toni Braxton, Destiny’s Child, Lady Gaga and Britney Spears. He is responsible for over 160 million record sales worldwide and the winner of four Grammy Awards, Mr. Jerkins is one of the most successful producers in the history of popular music. The fruit normally doesn’t fall too far from the tree. Watching Joy Enriquez Jerkin’s music video “Hallelujah” you begin to see how Joy has poured her life and love into her children and husband building a home of love for the glory of God while singing His praise! Heav’s Mom, Joy Enriquez is a music artist and actress herself. Joy began establishing a name for herself as a rising child star in her hometown of Whittier, California at the age of 5. She sang a solo at her kindergarten graduation, she was destined to take center stage. Joy was 15 when her dream began, the talented Latina singer entered the national television airwaves in 1995. Ms Enriquez appeared on the Star Search series, and won the female vocalist category for 11 consecutive weeks! Then she went on to sign with Babyface and LA Reid at LaFace/Arista Records. Her excitement grew in 1997 when she lent background vocals to the single “When you Believe” the pairing of Whitney Houston & Mariah Carey, for the Prince of Egypt (1997) motion picture soundtrack. And in 1999, she recorded the ballad “How Can I Not Love You” for Anna and the King (1999) soundtrack, which was nominated for two Golden Globes. Joy was paired up with Latin Pop superstar, Carlos Ponce for Disney’s Lady and the Tramp II (2001) soundtrack singing the all-time favorite spaghetti kiss song “Bella Notte”. Joy released her self-titled debut album on Arista Records. Co-produced by Babyface along with other writers and producers such as, Beyonce Knowles, Rodney Jerkins, Fred Jerkins and Soulshock & Karlin. Ms. Enriquez landed a major role as “Joy” on Spelling Television’s critically acclaimed family drama 7th Heaven, that aired on the WB Network and was rated number one. So there is a lot of musical talent in Heavenly Joy’s family tree, both on her Mom and Dad’s side of the family. Have you seen HOUSE OF JOY yet? One of the most talented (and hilarious) families on television today! Starring Joy Enriquez, the reality series follows the singer/actress as she balances her busy career with family life. Also starring Joy’s husband, Grammy® Award-winning producer Rodney “Darkchild” Jerkins, who has worked with a who’s who of singing stars including Whitney Houston, Lady Gaga, and NUVOtv’s own, Jennifer Lopez. The HOUSE OF JOY cast also features Joy and Rodney’s three kids — RJ, Heavenly, and Hannah — plus, Joy’s parents, Randy and Helena, and her brother, Josh, and sister, Tiffany. Between Joy and Rodney’s creative conflicts in the studio, and all of the hijinks in their house, the series showcases one of Hollywood’s most fun-loving families.